I created these lovely paper snowflakes using a YouTube tutorial from the wonderful Monica Gale. 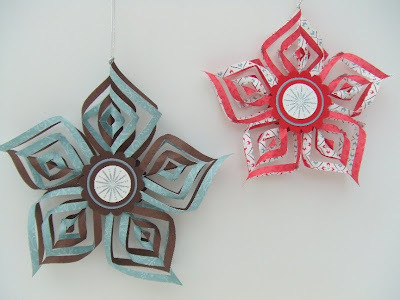 If you would like to have a go yourself, then here is the link - Paper Snowflake Tutorial. These snowflakes are really easy to make and take very little paper. I have followed Monica's tutorial, but just used smaller squares of paper - 6.5cm for the Blue and Brown Snowflake and 5.5cm for the Red and Blue Snowflake. Also this week we welcome a new DT member! The wonderful Teri S has now joined us. Please take a few minutes to checkout Teri's blog .... her projects are amazing and truly inspirational. Teri these are great decorations, beautiful....thanks for sharing these!! Awesome! LOVE these ornaments, looks quite fiddly, but worth it.